A black square on a white background and a tilted white square on an off-white background. That’s how geometric abstractions were introduced to the world by avant-garde artist Kazimir Malvich. It was in the early 1900s when Malvich displayed his pioneering works “White on White” and “Black Square” to the art scene along with his development of the art movement Suprematism, a mode of self expression through painting geometric forms like basic shapes but in non-representational compositions. Since then, the art form has evolved from Malvich’s simple work to complex collages of geometric patterns. The loyalty to the art form’s use of non-illusionistic and non-representational space, however, remained. 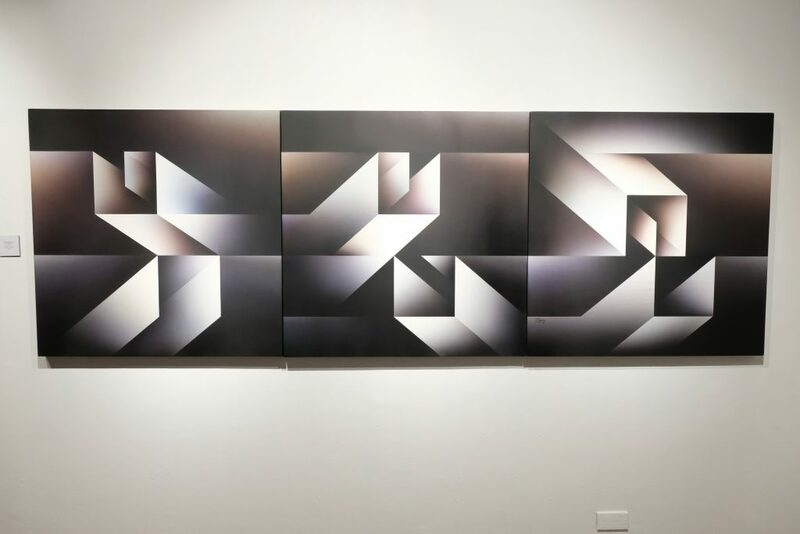 That is, until artist Rodolfo Gan unveiled “Prism” last night at the Upstairs Gallery of Finale Art File in Makati City, Gan’s latest exhibit of geometric abstract paintings that evoke an illusion and are representational. Rodolfo Gan with his paintings Sanctuary (left) and Vestiges of Time (right). This is actually Gan’s second solo exhibit after his comeback in 2014 after decades of painting hiatus. 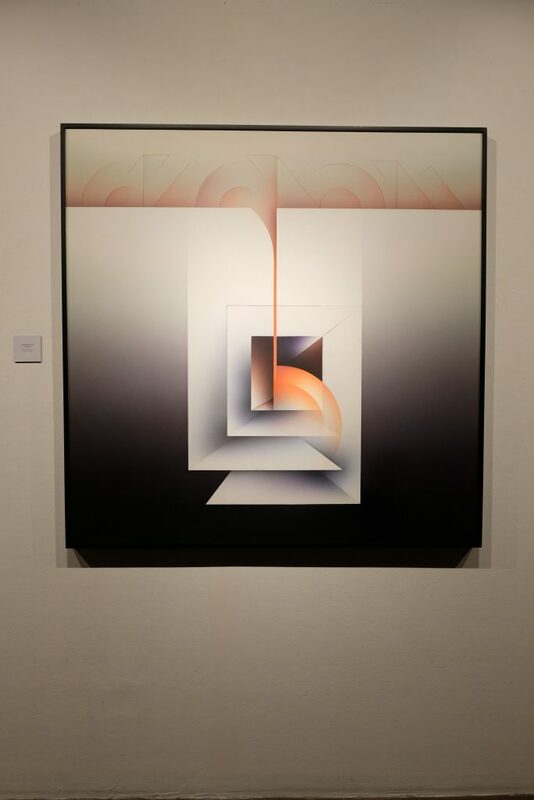 After studying fine arts from the University of Santo Tomas in the ’60s, he exhibited works at the Cultural Center of the Philippines (CCP) and the Luz Gallery, where he held his first solo exhibit in 1972. 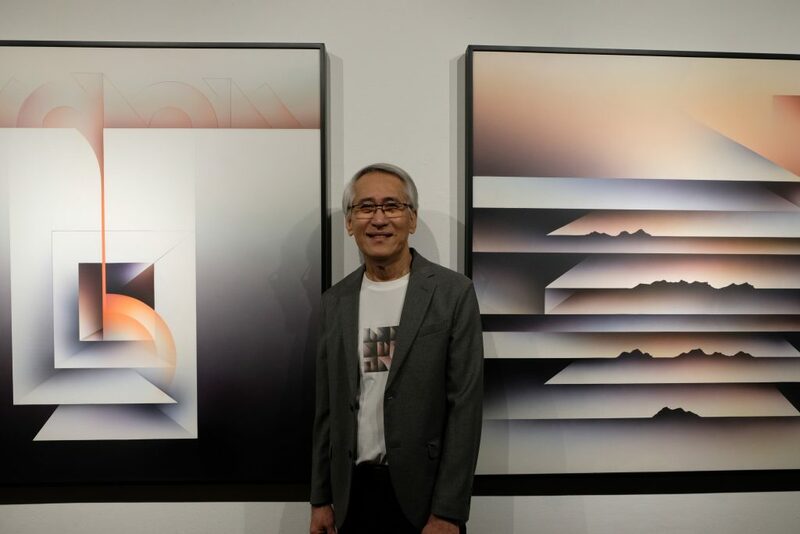 Despite already making a name for himself as a young artist (he was one of the Thirteen Artists of CCP in 1972 along with Danilo Dalena, Justin Nuyda, and Romulo Olazo), he had to take a break and focus on his family’s printing business. This is why in 2014, his comeback was deemed “one for the books” by art critic Cid Reyes. And in his 2019 “Prism”, his resurgence is continues. 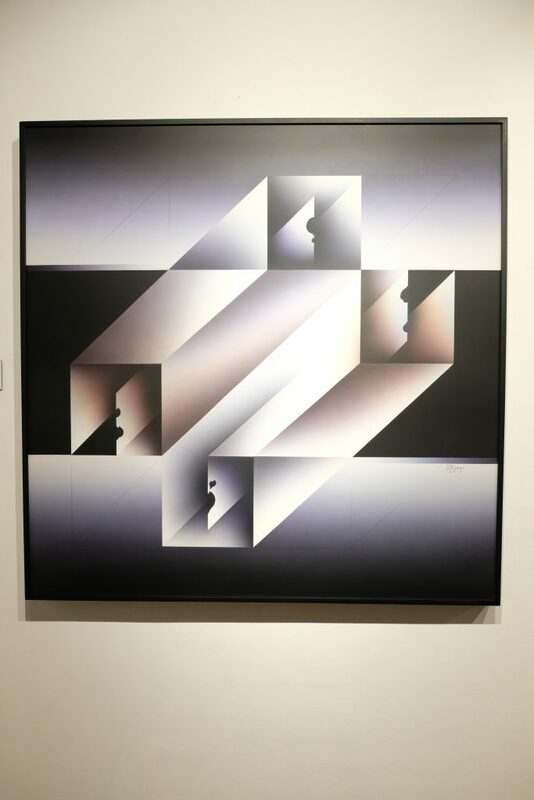 Although heavily inspired by Suprematism and Malvich’s geometric abstract art, Gan didn’t want to make his style look like the usually flat geometric abstractions. “In geometric art, what you see is usually what you get. It’s flat. You cannot go beyond that,” he said. 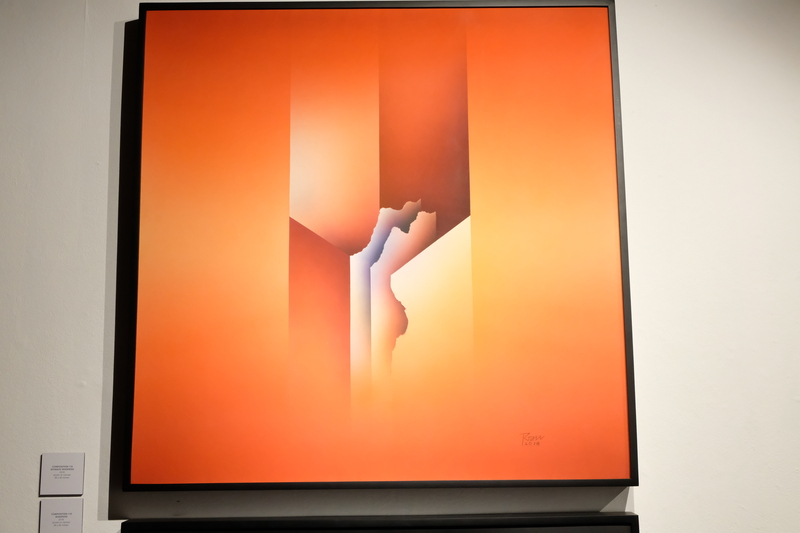 In his works, Gan played with Zobel’s use of fleeting colors in linear art. “I really admire Zobel’s works because it’s subtle, somehow minimalist which makes it look clean. I like that,” Gan said. With the use of his trusty airbush, the instrument he’s been fond of since his return to painting, Gan created textures on linear and geometric shapes through the play of lines and colors. And it worked. There’s more going on in the paintings than what meets the eye. His use of lines in the “Winds of Fortune” painting, for example, creates a labyrinthine illusion that elicits an endless movement. But is it going inwards or outwards? You’d never know. 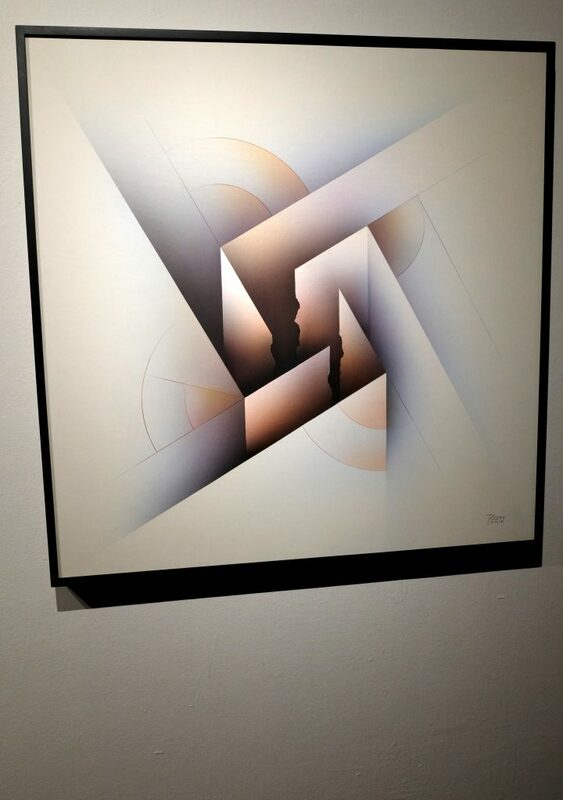 But unlike other illusions that you want to escape from, Gan’s painting is the kind that you would enjoy looking at. Instead of complexity with its labyrinth style, it evokes a serene movement. The same goes with his 36″ x 36″ painting titled “Intimate Whispers” which boasts of a dominant red hue that, ironically, makes you feel calm. Gan’s humble comeback continues and he proves that art, no matter how long he had taken a break from it, continues to move with him too. As Reyes put it, Gan has not lost his touch. And how would he? He remains bold and experimental yet unflustered and calm, which his works likewise reflect.